One of the things that I enjoy most is to talk about disruptive technological trends and how they will already impact our lives 5 years from now. I use this in my investment decisions, both for start-ups and for public companies. One of the most interesting areas for me is how quickly autonomous car technology and robotics are developing. My vision on this has evolved quite a bit since I moved to Canada in 2013, especially my view on the time line in which changes will happen (within the next 4-5 years) and the effect of robotics (more positive than I originally thought). Robotics and autonomous cars are actually the same thing, because an autonomous car is nothing more than a robot. I have predicted for years that robots will take over most of our daily tasks and that the majority of people will lose their jobs over the next 20 years. I now believe that this will go much faster, but I also believe that this does not need to lead to mass unrest if society prepares itself well for the coming changes. 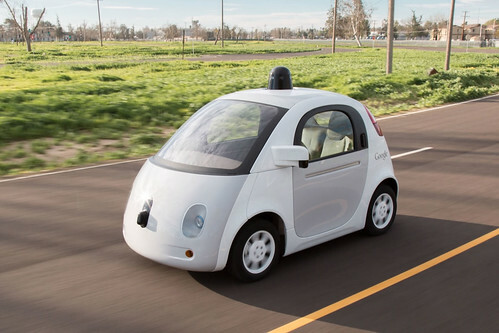 This post will focus on self-driving cars, I plan to write about the effect of mass unemployment later. Autonomous cars are a good way to explain the effects of robotics to people, because most of us use cars and can understand the changes that self-driving cars will bring. Within 5 years the first completely autonomous vehicles will hit the road (in 2013 I thought it would be in 2023, now I think it will already be by 2019-2020). Many cars already have limited self-driving features and these show how far we have come over the past years. Last month my wife bought a new car with some of these self-driving features and it’s quite interesting to try them out. Among others her car can parallel park itself or it can back into a parking spot. It is kind of scary the first time you use it, and I even braked because I thought her new car would hit the car next to us (message from the car: “please release the brake”), but once you have done it a few times you realize the car is a much better parker than most humans. The car also has automatic brakes in case the car in front of you suddenly slows down. When I was testing her car I drove up to a stop sign where a car was waiting in front of me of me. I saw that the car would start driving because there were no other cars at the intersection, so I drove up to him quite fast. About 15 meters before the stop sign, and right at the moment the other car started driving, Grace’ car suddenly took over the controls and started braking hard while making a beeping sound. It was very strange when it happened, but it’s actually assuring that the car forces you to drive more carefully. For me the big take away is how quickly you get used to these features. It makes driving easier and safer, and after using them a few times it feels totally normal. I think that once cars will become more autonomous we will immediately accept it and will let the car do all the driving. It will change the way cars look and feel. I don’t believe that fully autonomous cars will need a steering wheel and pedals. Once you have given control to your car you won’t feel the need to drive yourself anymore. That’s the mistake the big car manufacturers seem to be making, most still believe that people will want cars where you can take over from the computer if needed. It reminds me of the first cars in the late 1800’s that looked like coaches, so you could still put a horse in front of the it! Google doesn’t have this bias and its autonomous vehicle prototypes are just sit-and-go, without any controls for passengers. They redesigned the concept of a car bottom-up and that may turn out to be a very smart move. Given how much better electric cars have become over the past 3 years (Tesla cars are among the very best vehicles on the road right now) and how quickly battery technology and solar power are developing, my prediction is that the first autonomous cars will be completely electric. No more engines with moving components that need maintenance and can break down easily, but a simple but powerful battery powered car. This will have huge implications for the car industry, because many companies are still focused on gas- or diesel-powered engines, instead of focusing all their energy on electric technology. But not just that, once autonomous vehicles become widely available, car sharing concepts will take off and the whole automotive market will collapse. Why do you need 2-3 cars per household if these cars sit in parking lots 95% of the time? I believe that most people won’t own cars anymore but will subscribe to an Uber-like concept in which an autonomous vehicle will show up at your door whenever you need one. The number of cars will go down dramatically and if you are the operator of a parking garage you might as well start looking for a new career. Self-driving cars will park themselves outside of city centers to recharge their batteries, or more likely, immediately drive to the next person that needs a ride. Costs will be much lower than current taxi services, because there are no human drivers involved anymore (the majority of the costs for a taxi are salaries), because cars will become much cheaper (mass-produced luxury taxis without complicated engines will probably be produced for $15-20,000, and because of their electric engines you can drive them for more kilometers than normal cars) and because they don’t need expensive gas anymore (with better solar power and batteries the variable costs of driving will go down to almost zero). My prediction: transportation will become almost free. Hard to imagine right now what impact that will have, but for sure it will change the way we live. People might start to live further away from downtown for example. And supermarkets may disappear because ordering online will be faster and cheaper (immediate delivery, no delivery costs, and the supermarket doesn’t need expensive real estate). Traffic jams will disappear, not necessarily because there will be less cars on the road, but mainly because autonomous cars drive more efficiently (no sudden brakes) and will communicate with each other so that traffic lights are not necessary anymore. Check out this YouTube video to understand what will happen in intersections when you only have self-driving cars: https://www.youtube.com/watch?v=r7_lwq3BfkY This assumes that there are no human driven cars anymore, which will not happen 5 years from now, but it will be the case in 15 years. Possibly older cars will be have to retrofitted with autonomous systems or they will not be allowed to drive during rush hour or on certain roads. Another big advantage is that there won’t be many accidents anymore. Driving is one of the most dangerous activities, but that will change once autonomous vehicles take over. Insurance companies should take this into account, if you are a car insurer your business may go away over the next couple of years. I am very positive about the changes that will happen in the automotive industry over the next years and the additional freedom and free time it will give many of us. It will completely disrupt some industries but it will also create a lot of new opportunities. I look forward to these changes and hope to drive (or better: be driven in) an autonomous car by 2020. Robotics is no longer rare today. There are a lot of robotic systems been released already. I can already imagine how life would be in the next 20 years.